Anyone who has visited Yellowstone National Park can attest to the beauty of Grand Prismatic Spring, a body of water that has a deep, brilliant blue color at its center and measures 370 feet in diameter. The pool is also recognized around the world for its other stunning tints, produced by the bright, multihued algae and bacteria around its edges. Since Yellowstone was declared America’s first national park in 1872, thermal features such as this have been protected for our enjoyment and that of future generations. But on August 2, 2014, a tourist from the Netherlands, Theodorus Van Vliet, crashed his drone into the spring. 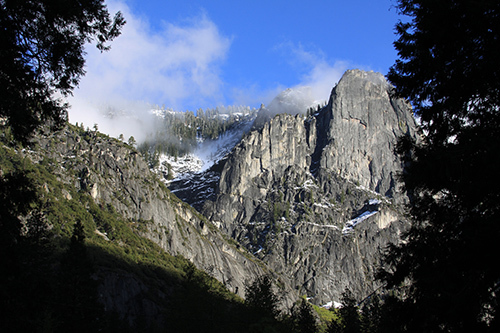 This incident occurred despite a ban that was instituted on June 20, 2014, on all UAVs (unmanned aerial vehicles) in all National Park Service-controlled lands and waters. Officials have yet to determine what damage may have been caused to Grand Prismatic Spring because of the sunken drone. But given the trauma and desecration this incident has surely inflicted on one of our most cherished natural wonders, is it time to establish tighter security in our national parks? Leading up to the ban on drones in national parklands earlier this year was a string of bad behavior by drone operators since this type of personal aircraft became a popular and widespread photography tool. 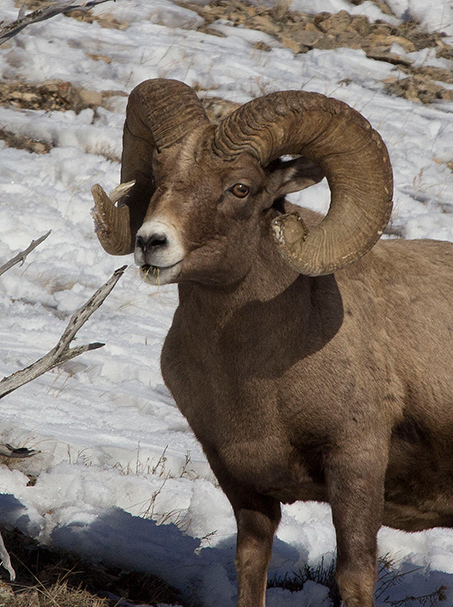 For example, in May 2014, a UAV was spotted near several, young bighorn sheep in Zion National Park, causing them to get separated from the adults in the herd. Such disconnection from older animals could cause the young to die. Even after the ban was put in place, negligent conduct by drone operators continued to occur. On July 17, 2014, a German visitor crashed a drone into Yellowstone Lake and then gave a false report to a government official. 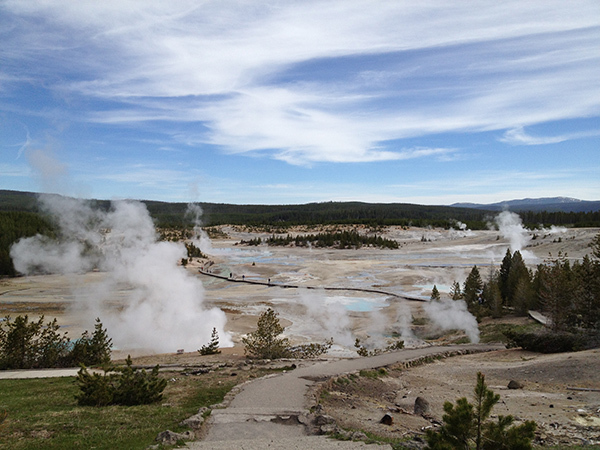 And on August 19, 2014, an Oregon man flew a drone over Midway Geyser and near bison. How to remedy the August 2, 2014, Grand Prismatic Spring incident remains unclear. The landmark is the largest hot spring in the United States and the third largest in the world. What further damage could be caused to it by leaving the drone there or by taking it out is still unknown. Either option could change the 121-foot-deep pool forever. Despite the irksomeness of noisy drones and some incapable operators, it can’t be denied that UAVs have given us some outstanding and breathtaking views of our natural wonders. A new class of amateur, aerial videographers has enabled us to see a gorgeous world we may not otherwise ever be able to witness. Drones, it could be argued, are much like cell phones and tablets: just another tool to realize artistic expression. The National Park Service itself has allowed unmanned aircraft on a limited basis for remote research projects in California’s Mojave National Preserve, in Hawaii’s national parks and in Washington’s Olympic National Park. And to be fair, drones aren’t the only items that find their way into the hot springs of Yellowstone. According to park officials, visitors often use such natural features as wishing wells or even garbage cans, throwing coins and trash into the springs. I, for one, would hate to see the entrances to our national parks become like airport security checkpoints, with searches of our cars and inspections of our picnic baskets. On the other hand, I’m not sure people can be trusted to resist the urge to send their cameras into national park airspace to get those once-in-a-lifetime shots of the natural beauty that called them to the parks in the first place. Do you think we need tighter security in our national parks to protect our natural wonders, wildlife, and ourselves from drones? I hate over regulation, especially if it could infringe on the younger generation to expand on the knowledge and skill of their teachers. We need to allow drones, I live in Hawai’i and it has been tough, but the benefits it has shown out weighs on the bad. I believe permits are needed in this case, but not a permit that hinders the use of. If an individual comes to the park with one, then allow them a permit. Let it be known where it is allowed and where not. No fees, No overbearing restrictions and you will be surprised in the amount of cooperation the system will receive. Sorry, Candice, I skimmed earlier – evidently too much! 😉 I think drones could really ruin the ambience of National Parks. I would wish to see anyone having to apply for a licence to use one – and this info be available in advance – thus anyone can apply with good reason, legitimate conservation or even responisble commercial initiatives be facilitated, but information is available to public on it. Should be transparent. Yes, as stated in my article, the National Park Service instituted the ban on June 20, 2014 (see paragraph 2 of the article). You can click on the link within that paragraph on the words “a ban,” and that will take you right to the official press release from the NPS. Thanks for the comment. —C.G.A. As far as I was aware, US too had banned drones in National Parks in July, pending a review on how to handle the issue? I think its always about educating people about the importance of conserving nature as how it is meant to be! For those areas where drones are banned, the obvious solution is very heavy fines and even imprisonment where the safety of others are jeopardized. I believe the FAA is already drafting rules on their use. Transport Canada is also doing much the same. There are already enough, near-miss mid-air collisions in air traffic controlled regions, without having to introduce small consumer drones that don’t even show up on radar. Then there is the risk to the populace, should one errant drone tumble from the sky. Ban them from unlicensed and unregistered users I say! Drones can be a very serious threat to wildlife everywhere in the world. In South African National Parks we have banned the use of drones. How do we regulate common sense and good manners? The use of drones should be by permit and should be regulated. Yes, the parks should be able to be enjoyed by the public. However, the parks were set up to protect our natural resources and treasures. Until the public can learn proper nature etiquette, the Park Rangers will have even more on their shoulders. Personally, if I am enjoying the great outdoors, the last thing I want to hear or see is a drone. As someone who has had these wretched things buzzing sites where we have been working ‘piloted’ by some mindless idiot with no consideration for others or even the faintest understanding of the subject being chased I would like to see drones licensed for use outside the owners front room and banned from all national parks and similar areas. Anyone who can stump up the cash and take a one day training course seems to be allowed to fly the things anywhere they want and anytime. Although I believe guns should be restricted I would happily take up a shotgun license and treat the damn things as clay pigeons. That’s a loaded question, the kind a government would use to solicit false representation of opinions to ban drone use. It’s the difference as asking if a bartender should ban people from drinking, or if a bartender should ban drunks from drinking (more). You will get two very different results. I believe requiring a licence to operate a drone can be a good thing, if only to force the users to learn the how-tos, safety practice as well as acceptable behaviors. But I don’t trust the government and big corporations to not to corrupt the system so that they own the sky. This topic is larger than photographers, or the occasional interruptions of some wild life. Drones are a way of the future. If influential enterprises such as Amazon and google investing heavily on it, you can bet the future will have your sky filled with drone traffic. The government and these big corporations would naturally not want private or competitors’ drones cluttering up the air way. If they can make it expansive and difficult to acquire licence to fly, they will do it because it just means more profits for them with less competitors. IE, why wouldn’t Amazon take over the pizza delivery business if smaller franchises or your mom and pop shop cannot fly? So yeah, I am concern with irresponsible drone use, but I am more concerned with the public not knowing the real implications. Be careful what you wish for. What is needed is more common sense among park visitors. It is distre3ssing to be aware of all the ways humans can act stupidly in our parks. This drone sinking is just another example. This spring is my personal favorite of all the springs in the park and it is my hope that the wreckage can somehow be removed without damaging the spring. Asking the Park Service to have security checkpoints would eat up the already tiny budget that is provided to our Natl Parks and I don’t guess that the current congress would put substantial new funds into the effort. It would just be another way to make policemen out of Park Rangers, rather than letting them be custodians of the Park’s natural resources. I don’t think more security is the answer. The Park Service has charged the guy who crashed the drone into the Prismatic Springs. If he receives a hefty fine or even a jail sentence and the Park Service continues to enforce the existing rules maybe idiots will get the message.